One of the best Repeatables so far! 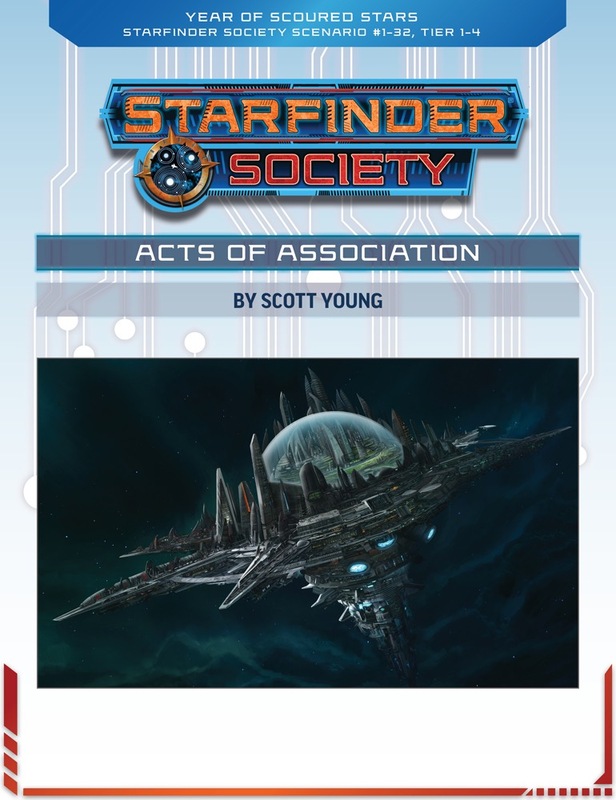 Acts of Association is, in my opinion, the best repeatable scenario so far. As a repeatable scenario, this adventure has some randomized elements to it, including the locations visited, the dignitary your PCs will be escorting, and their personality traits and preferences. Although there's plenty of opportunity to get into some fights and show off your skills, this scenario is heavily focused on social interactions. Although social skills will be helpful, it's your players actions which matter most, which is really nice to see. There’s a series of seven different pre-made dignitaries, as well as an eighth dignitary which is created entirely by the GM. In addition, each dignitary has randomized personality traits, values, taboos, and attractions they want to see. These attractions will determine the locations your PCs visit. I really enjoy the pre-made dignitaries and the random personality traits. They’re all unique, memorable, and are going to be great fun to interact with. As a lot of this scenario involves social interactions, playing the scenario through with different dignitaries will make each play through unique. As an added bonus, playing through the scenario with the same dignitary can also have its own surprises, as they may not be the same person or value the same things the second time through. I enjoyed the rather mundane tourism destinations that all seem to go awry — either this poor dignitary has the worst luck or Absalom Station is the worst place to go on vacation! There’s a lot of opportunity for clever use of skill checks and combat, and how you handle each situation can affect what the dignitary thinks of you — although how it affects them depends entirely on your actions and their personality traits. Their outlook matters, and you can’t just leave all the social interactions to your most charismatic PC — which is great! The downside to all this randomness is how loosely scripted the social interactions are. The reactions of the dignitaries is entirely up to the GM to determine (based on their randomly rolled traits), which puts a lot of work into the GMs hands — particularly when you take into account how much of this scenario is social interactions. It’s definitely going to take some prep work or some great improv. Still, in the hands of a decent GM Acts of Association is going to be a lot of fun and really memorable. Another minor downside is the number of attraction options. There’s only six locations, and on each playthrough the dignitary will want to visit four of them. That means that on your second playthrough you’ll already have some overlap. That said, it’s more variable than the other repeatable scenarios out there, so I think it’s going to be a popular one. It's certainly my favourite of the Repeatables so far. Acts of Association has some nice player handouts — dossiers on each of the dignitaries (although you’ll only get one on a playthrough). Unfortunately, one has a typo. After labelling one of the dignitaries preferred pronouns He/him he’s referred to as she/her throughout the rest of the dossier. Overall, I think it’s a really fun scenario that’s sure to create some memorable moments when run by any GM willing to embrace the roleplaying and social interactions. I'm loving all these repeatable 1-4's that have been released in the first season of Starfinder. What maps will we need for this and 1-33? I’m looking forward to running them! I second the question of maps. I would be appreciative of the opportunity to order the maps called for in time for my monthly subscription shipment. It’s always nice to have the map when the scenario drops. *Note: This scenario does not require you to use all these maps, but some are required based on which encounters are randomly generated as part of the randomized elements of this scenario. Definitely got some laughs reading this one. I had a blast writing this one... so many NPCs!